Built from 1958 to 1999. Discontinued. Better Pack® Electric model BP555 series are the best electric machines on the market today. With color coded selective measuring lengths and the most advanced moistening system, you are assured of a strong, safe carton closure with the minimum amount of tape. Triple brush moistening and a patented top heater deliver hot tape for foolproof adhesion. Only with hot tape can you be sure that all the tape’s hard dry glue is reactivated in the split second it takes to dispense it. Hot tape is "alive." It hugs the Kraft of the carton to form an inseparable bond even if it is not carefully rubbed down by the packer! The top heater heats the tips of the brushes where the tape passes over the brushes for "zone" heating. Adjustable pressure bars regulate flow of water for different types of tape and sealing situations. 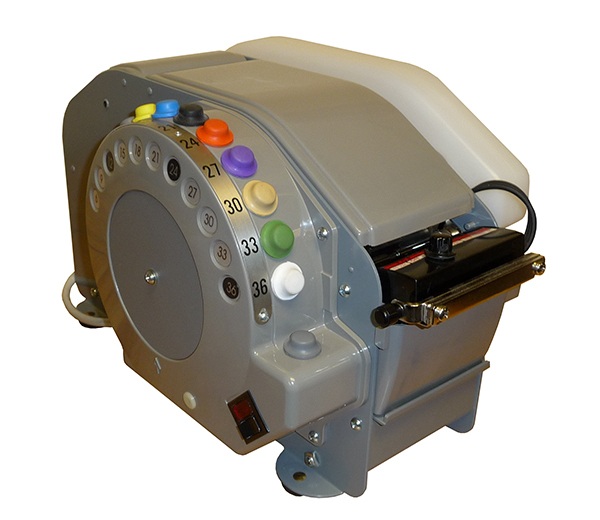 The Better Pack® 555 electric machines handle reinforced and paper gummed tapes from 1 ½" to 3" wide - models available at slight extra cost for tapes up to 4" wide. Five different models are available. Model BP555-S dispenses 6"-36", with 6" button first, BP555-L36 reverses the key order, BP555-L45 offers 15"-45". The longer length machines were designated as the BP555-LLS offering 12"-72", and BP555-LL from 30"-90". (The S, L-36, and L-45 are in 3" increments, the LLS and LL are in 6". The following options are still available: CodeTaper, Taper Aerial. With the color coded patented Tapeculator, a quick glance will tell the packer what button to touch for the correct length of tape. On-the-job tests have shown tape waste is eliminated to the extent that many shippers who use the Better Pack® 555 with the color Tapeculator are now sealing every fourth carton free with the tape they have saved.